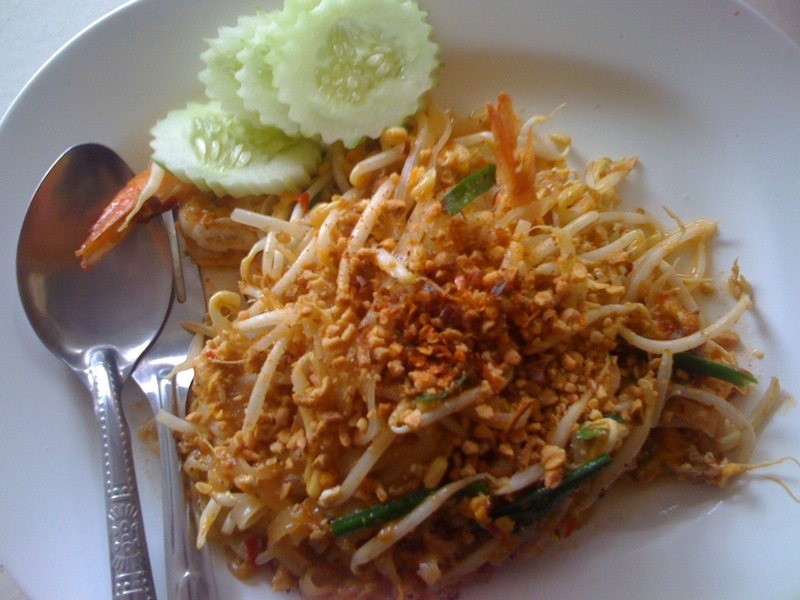 On Friday, I had one of the yummiest and most popular Thai food, “Pad Thai Kung”. Pad Thai Kung is fried flat broad rice noodles with shrimp, “Kung” stands for shrimp. Everyone who visits Thailand must try Pad Thai. Pad Thai is sweet, a little bit sour and a little bit spicy. Like most of other Thai food, preparation time for Pad Thai is not long but getting the ingredients right is the challenge when it comes to making Pad Thai at home. Although mostly broad rice noodles are used to make Pad Thai, it can also be made with regular thin rice noodles. In our canteen, there are two shops that sell Pad Thai, one shop usually doesn’t have the broad rice noodles, so she makes it with the thin ones, which is equally delicious. In Thailand, like many other places in Asia, rice is the dominant meal. Thai food consists of three main types of curries green curry, yellow curry and the red curry. All these curries are served with rice. Green curry is made with coconut milk and the green curry paste which consists of lemon grass, shallot, coriander, ginger,basil, cumin and pepper ground together and blended with coconut milk to make a paste. Yellow curry paste consists of fresh turmeric, curry powder, onions, ginger and garlic ground together. The red curry paste is the most spicy of all, it consists of lemon grass stock, small red chillies, dried hot red chillies, ginger and garlic ground together. Among the three kinds of curries, yellow curry is my favorite since it is mildly spiced and has the flavor of curry powder and it the most familiar one for me :). After rice, the second most widely served dish in Thailand is noodles. There are many kind of noodles available in Thailand. Thai noodle soups are one of the best and resembles Vietnamese “Pho”. They use simple ingredients and yet they are full of flavor and tastes very good. Besides noodle soups, a variety of fried noodles are also served in Thailand and Pad Thai is the most authentic one. Soak the noodles in hot boiling water for 2 minutes until soft and cooked. In a frying pan heat the oil and fry the garlic and shrimp until done and then break the egg and stir. Add the noodles, pad thai paste, fried tofu, tamarind juice, fish sauce, sugar and stir for sometime until all the ingredients are mixed well. Then add the bean sprouts and chopped shallots and its done!! To serve, place it in a plate and add the ground peanuts and dried chillies on top. Serve hot and enjoy the most delicious Thai food!! The method and ingredients are according to what is used in my canteen. Our canteen has open kitchen, so we can go and watch while our food is being prepared, how great is that!! Thai food has a lot of variety. The five day recipes I have included in this blog is just the beginning of my experience with Thai food. I will try to write more about other Thai food that I enjoy as well. Other dishes that we order in our office canteen are “Tom Yum Kung(spicy soup with Shrimp )”, “Kai curry/Kung Curry(Chicken/Shrimp with yellow curry paste)”, “Kai Kathiyam(Chicken Garlic)”, “Sunlek Yai(noodle soup)”, “Som Tam(spicy papaya salad)”, “Yam Pla(fish salad)” to name a few.